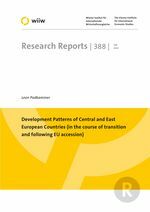 The patterns of Central and East European countries’ (CEECs) development in the course of transition and following EU accession have been determined by these countries’ generally uncritical adoption of policies consistent first with the commandments of the Washington Consensus and then with the requirements of EU membership (including the acquis communautaire). Despite more detailed (and largely less important or relevant) cross-country differences (institutional, structural etc.) studied in the panel-econometrics models of transition, the main macroeconomic tendencies characterising transition (and the later stages) can be naturally interpreted in terms of the impacts of demand-side factors. Wage developments turn out to be essential. The policies followed all along constitute the ‘integrative growth model’. External liberalisation, which is the most essential pillar of that model, exposed the CEECs to recurring problems over external imbalances, bubbles driven by capital inflows and resulting growth instabilities. The CEECs suffer from persistent (Keynesian) unemployment but are reluctant to conduct active fiscal policies. The hopes invested in the integrative model of CEEC growth seem to have been disap-pointed. After some acceleration (but from very low levels, which were additionally de-pressed following the policy-induced deep transitional recessions) CEEC growth collapsed in 2009 and slowed down to unimpressive levels thereafter. Under growing integration into the European Union, CEEC growth rates seem to converge to the low rates prevailing in the ‘old’ EU. But such a convergence in the growth rates does not promise a catch-up in income-level terms. Worse still, CEECs do not prove resilient to the crises shaking the ‘old’ EU (and the euro area in particular). Last, but not least, it cannot be overlooked that whatever progress made in the CEECs, it was achieved at a high cost. In most cases high unemployment has become endemic there while high and growing internal income (and social) polarisation – the opposite of cohesion – feeds political radicalism, likely to explode sooner or later. Unfortunately, transition came much too late. Had the transition happened in the 1960s, or even in the 1970s, the CEECs would have been in a much better economic position vis-à-vis the developed Western countries. More importantly, the ‘economic model’ then prevailing in the West would not, if taken over by the CEECs, prescribe a wholesale external and internal liberalisation – and, as such, would not force them into a race-to-the bottom in fiscal and wage policies. This ‘old West European model’ would, most probably, be more conducive than the integrative one to the CEECs’ faster, more balanced, and more sustainable economic growth. The ultimate goal of convergence with the rich Western partners would, most probably, be better served under a system with built-in limitations to free trade, free capital movements – and more scope for traditional industrial and trade policies. The CEECs are in a serious impasse now. But so are other EU Member States. Arguably, the economic policy-making in the EU (and in the Member States) needs to improve. There is no shortage of proposals in this respect. The official line (epitomised by the consecutive versions of Fiscal Packs, or Pacts) boils down to the insistence on stricter, and more disciplined, adherence to the original spirit of the Maastricht Treaty. The recipe is more of the same. However, there are good reasons to believe that following that official (‘austerity’) line will do nothing to ease the vitally important problems plaguing the entire EU – and thus also the CEECs. A more radical overhaul of the basic paradigms of EU economic policy-making may be needed. Whether, and under what circumstances, such an overhaul can happen is yet another question.